1. Expanding and improving transition planning, professional development, and peer learning opportunities for new and veteran presidents. 2. 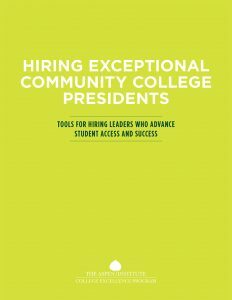 Providing boards greater and more integrated assistance to hire, support, and work with presidents who will act not just as institutional stewards but also as forward-thinking educational leaders in a changing environment. 3. Advancing new and expanded ways to identify and develop a diverse presidential talent pool. 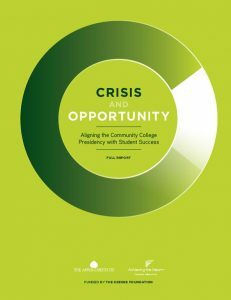 The Task Force report, Renewal and Progress: Strengthening Higher Education Leadership in a Time of Rapid Change, offers guidance for boards of trustees, presidents, search consultants, and other stakeholders regarding how to ensure that a new generation of campus leaders has the deep and broad skill sets needed to meet the demands of an increasingly complex college presidency. We are grateful for the wise counsel and thoughtful deliberation of Task Force members, as well as to valuable observations from focus groups of faculty, deans, student leaders, trustees, and search advisors. Click below to read the executive summary and full report, Renewal and Progress, made possible through a generous grant from The Arthur Vining Davis Foundations.